“When I received notification I had won this award, I was so excited and truly honored,” she said. “This means that my peers around the state recognize my efforts and years of hard work building a strong EC-12 physical education program at Texas A&M-Kingsville. “When you work relentlessly day-in and day-out, it is a special moment when you find out people are watching and taking notice of what you have accomplished. When I came to Texas A&M-Kingsville, I was determined to build a strong program that would produce quality physical educators for South Texas and my program does that. Parents and school administrators can rest assured that our teacher-prep graduates will benefit the children in South Texas or anywhere else they choose to teach,” she said. 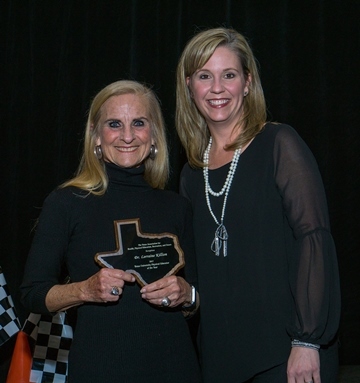 In addition to the TAHPERD award, Killion was the Texas A&M-Kingsville selection for the Chancellor’s Academy of Teacher Educators, an initiative of The Texas A&M University System. “Being recognized by The Texas A&M System and by the state teaching organization in one year can only bring more accolades to the outstanding work we are doing here at A&M-Kingsville. I am thankful that people are not only watching, but also rewarding my efforts. It validates the adage that hard work pays off. “I try to be a role model for my students. I can only hope that by seeing my efforts, they will follow suit and deliver quality programs to their respective schools, Killion said. Created in 2011, the Chancellor’s Academy of Teacher Educators of the Texas A&M University System honors faculty members who have significant impact on the preparation of teachers in the field of education. The award comes with a $1,000 stipend and a special commemorative medallion to be worn as part of the recipient’s traditional academic regalia. Killion has worked at Texas A&M-Kingsville in the College of Education and Human Performance since 2011. Prior to that, she taught for five years at Lamar University and one year at Houston Baptist University. She earned her bachelor’s degree in education from Stephen F. Austin University. She has two master’s degrees, one in humanities from University of Houston-Clear Lake and the other in physical education/sport pedagogy from Prairie View A&M University. Her doctoral degree is in sport pedagogy with a minor in sport psychology from University of Houston. Killion is the author of numerous publications and is a member of several professional organizations including the SHAPE America, North American Society for the Psychology of Sport and Physical Activity, the Association for Applied Sport Psychology, the Association for Supervision and Curriculum Development and the National Association for Kinesiology in Higher Education.